The Perseus galaxy cluster is filled with a hot X-ray-emitting gas, as seen in this image from NASA's Chandra X-ray Observatory. 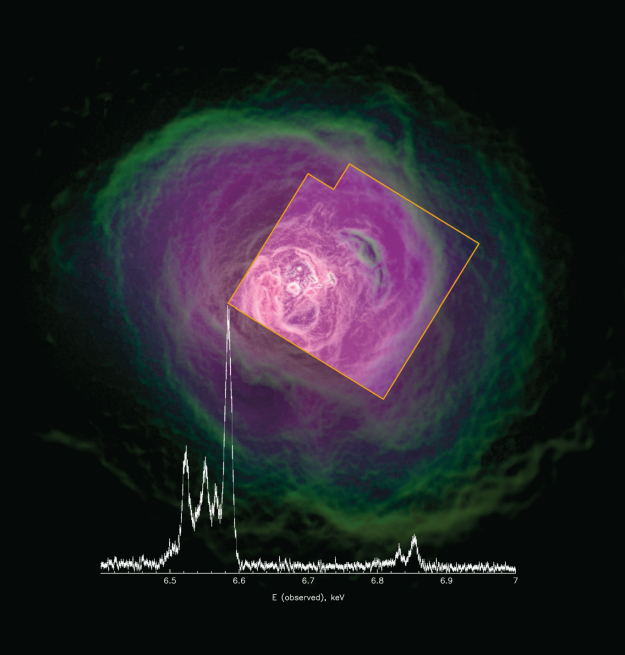 Astronomers using the Soft X-ray Spectrometer aboard the Hitomi satellite have, for the first time, mapped the motion of this gas and determined its velocity structure across a large part of the cluster. The square overlay shows the area observed by Hitomi. The X-ray spectrum is also shown with emission from helium-like iron (that is iron with only 2 electrons) on the left and hydrogen-like iron (iron with only one electron) on the right. The narrowness of the emission lines shows that random motions in the 50 million K hot gas in the Perseus cluster core are only 164±10 km/s along the line-of-sight. This represents a dramatic improvement in the measurement precision of the velocities which are crucial for determining the total masses of clusters and the energy flow from the accreting black hole at the cluster centre.